TOBY JONES Cast As "THE HOST" in Lionsgate's "THE HUNGER GAMES"
Toby Jones has joined the growing cast of Lionsgate's The Hunger Games. Jones will play the host & narrator of the games alongside Stanley Tucci reports Deadline. Gary Ross will direct the adaption of Suzanne Collins' hit dystopian novel. The actor probably best known for his portrayal of "Karl Rove" in Oliver Stone's W. will join the very impressive cast list which includes as of today Lenny Kravitz. Jones will next be seen in Captain America: The First Avenger, and Steven Spielberg's The Adventures of Tintin. The Hunger Games will hit theaters March 23rd 2012. If you have not already done so, read the book. 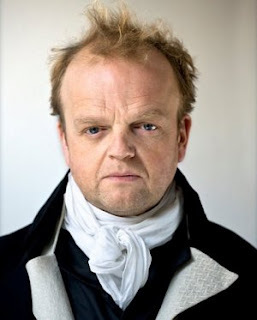 I'm reading: TOBY JONES Cast As "THE HOST" in Lionsgate's "THE HUNGER GAMES"Tweet this!